Dubai: The first round of formal sales of apartments at Dubai’s next prestige project — The Royal Atlantis Residences on the Palm — starts on Saturday (January 28). 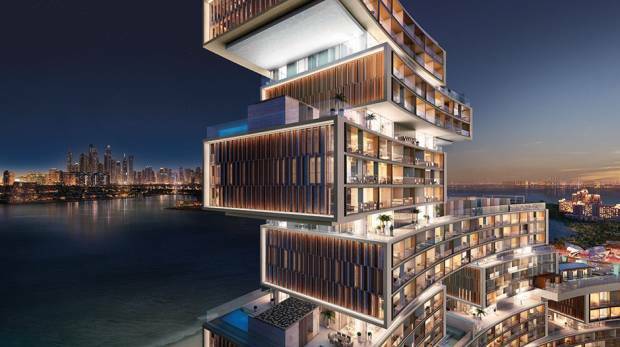 The largest unit among them — at 5,821 square feet — carries a list price of Dh37.5 million (just over $10 million). Only a limited number of units — about 20 to 30 — will go on sale that day. To date, 12 units of the upscale homes have been sold through private viewings, with the first unit being bought by an Emirati investor. The others were acquired by an eclectic mix of international buyers. In all, there will be 231 apartments, with the smallest coming in at just under 1,500 square feet. Prices start at Dh7.65 million. (The overall development cost was initially set at well over Dh1 billion. An official figure has not been revealed. The project will cover 10 hectares.) The new Atlantis project — featuring a standout design that gives the suggestion of entire floors being suspended and with extensive free spaces in between — will also have an extensive hotel component — 795 rooms. The building will go up to a height of 193 metres, with the hotel side going up to 43 storeys and the residential capping it at 37 levels. A standout feature will be an all-day “sky pool”, set at 100-metres high. Future owners of the residences will also be able to tap the breadth of amenities on tap at the original Atlantis, The Palm. In terms of actual location, there will be the water park — one of the city’s top attractions — between the new development and the existing one. “The concept and design of Royal Atlantis Residences was two-and-a-half years in the making, and the final design was chosen from among five shortlisted,” said Rayini Perera, Senior Vice-President — Sales, Marketing & PR, Atlantis, The Palm, Dubai and Global Partnerships, Kerzner. New York based KPF emerged the winner, and a host of other specialist consultancies were also brought on board for the individual elements that would then make up the whole. For instance, the fire and water elements will come alive on the walls at the entrance to the property, courtesy one of the consultancies involved WET. Knight Frank, the UK headquartered real estate consultancy, is handling the residential sales. And it is using the same strategy deployed in selling signature developments such as London’s One Hyde Park (where units are priced from £20 million) and New York’s 432 Park Avenue. And the consultancy realises that the sale process is not something that can be got through in a hurry. “It will be selling by dialogue — this is definitely not another typical Dubai projects,” said Maria Morris, Partner at Knight Frank. “This is a project that was conceived from the internal and then take in the external.